Brushing your teeth is an important skill that children need to learn to maintain oral health. Here are some tips for helping children practice, and how to make it a good experience for them (and you!). Choosing the right toothbrush: For a young child, use a soft-bristled toothbrush designed for infants and small children. Older children may prefer a toothbrush with their favorite character on it, or an electric toothbrush just like you use. This can help to make it a fun experience for them. Toothpaste: Use toothpaste with fluoride that the child likes and that feels good. Some toothpastes come in flavors, others in different colors. Whatever your child’s preference, make sure to use the right amount of toothpaste on the toothbrush. o Ages 3 to 6: use a pea sized amount of fluoride toothpaste. o Fluoride toothpaste is not meant to be swallowed, so make sure to help or watch children while brushing. Older children should make sure to spit out the toothpaste into the sink after brushing. If the child cannot spit. Have the child tilt their mouth down so that the toothpaste can dribble out. Timing: Encourage your child to brush for 2 minutes. Use a timer, a short song, or counting as a game to help encourage brushing. Some toothbrushes are available with songs, lights, or timers built in to help encourage 2 minutes of brushing time. Start early: No teeth? No problem. Simply going through the motions by regularly brushing and cleaning gums (with a soft bristle infant brush) still serves a very useful purpose. 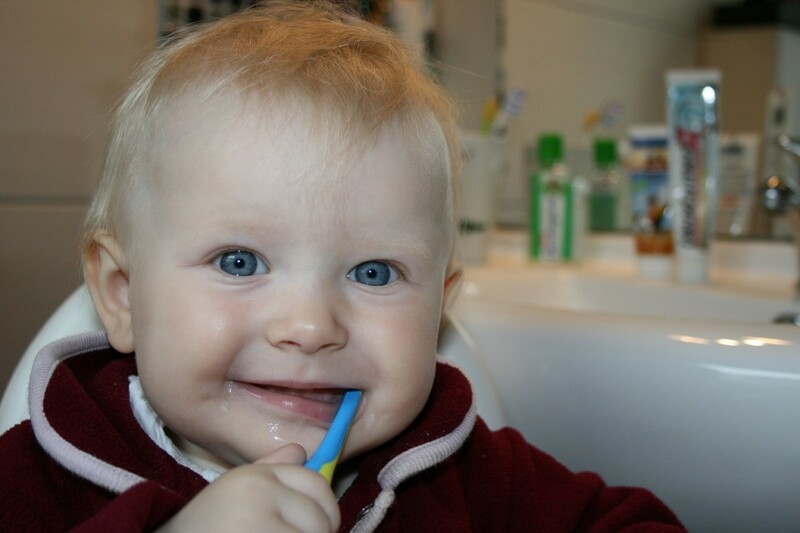 Right around the age when you’re likely to start brushing, your child is likely to start grabbing. By giving your child a brush (or 2) of his or her own, you can avoid a fight over yours. Brush often: As adults, we often only brush our teeth at bedtime. However, the best method is to brush after eating, keeping those chompers clean of food. If you start your child off with this habit early in life, they may be more likely to make it a lasting habit. Check their work! If your children want to brush on their own, by all means let them. Just don’t forget to check afterwards to make sure they did a good job. Take this opportunity to proudly check out their work, while casually doing some touch ups of your own. Pay attention to all the teeth: Direct the child’s attention to the teeth that are most likely to be neglected. While you’re helping them brush, describe what you are doing in terms they will understand. Point out the “biting” teeth (the chewing surfaces), the “smile” teeth (those right up front), and the tricky teeth in the back. This article is sponser by the Pawling offices of Children’s Medical Group. Our Pawling NY pediatricians care for children from Pawling to Poughquag, from Dover to Patterson and many other communities in Dutchess County. We provide a small office environment where you get to know your doctors, while having all of the resources that a large pediatric practice can offer. Call today for your appointment with Dr. Lessin in Pawling! Join The Children’s Medical Group on May 22nd and GO BLUE!